We've all heard of the pink tax: That pesky price hike on products marketed toward women ( 7 percent on average, according to the United States Congress' Joint Economic Committee ). But who is actually doing something about it? Home essentials company Snowe, as it turns out. Snowe's new blush sheet set and duvet cover will price in at 7 percent cheaper than their neutral bedding. So, the opposite of the pink tax, if you may. It's the pink discount. The blush bedding launches today, and this offer will last for an indefinite amount of time. The sheet sets start at $174.84 rather than $188, and the duvet covers at $184.14 instead of $198. This is all to bring attention to the issue (considering women also make less money than men to begin with), and to empower women nationwide. Snowe is also in support of Rep. Jackie Speier's proposed Pink Tax Repeal Act, which would enable the FTC to crack down on this practice. "We've been aware of the pink tax for a while, but it became especially (and quite sadly) clear to us when shopping for a gift for a friend's child and seeing the difference in prices for identical products in blue versus pink," Snowe co-founder and co-CEO Andres Modak told Hunker. 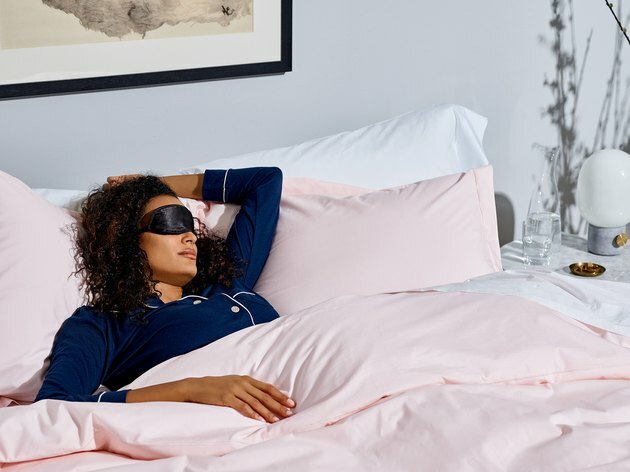 "We've wanted to do a campaign to build awareness for this unfair practice for a while, but since Snowe is built around gender neutral home essentials, we weren't sure where it would fit in." "Luckily, our customers were the ones to get the ball rolling," continues Snowe co-founder and co-CEO Rachel Cohen. "They've been asking for pink bedding for a while, and this felt like the perfect opportunity to contribute toward building awareness. Why not launch blush-colored sheets and duvet covers — for all genders, of course — but mark them down 7 percent? It's a chance for pink fans to catch a break for once, and lets us share an important issue with the Snowe community."